We don't care if you're a prince, a pauper, or a priest; when the zombie apocalypse comes, no one will be safe. That's because the zombie virus is an equal opportunity infector. It doesn't like to play favorites, and it certainly has no prejudice; it's nice and fair that way. Some people just still don't seem to get it. They think a lot of power, money, or voodoo might keep them safe. Have they not seen the movies? They'll be the first to go! You can never assume you're safe or that you somehow won't get infected. The virus has a good sense of irony that way and seems to like to pick on these people especially. Of course you have few options for dealing with the oncoming virus. 1. You can hide. Good method, but it's usually tough to guess how much time you'll need for supplies as we have no idea how long it'll take for the whole thing to blow over. 2. You could start working on a cure now. Although, we don't know about you but we're not great with the science. 3. You could join the party early. Like, why not, right? 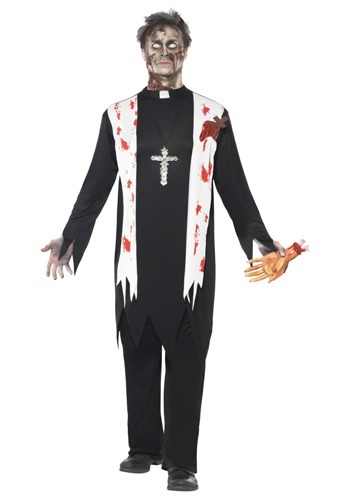 You could just throw in this Zombie Priest Costume and you'll look like you're infected already. 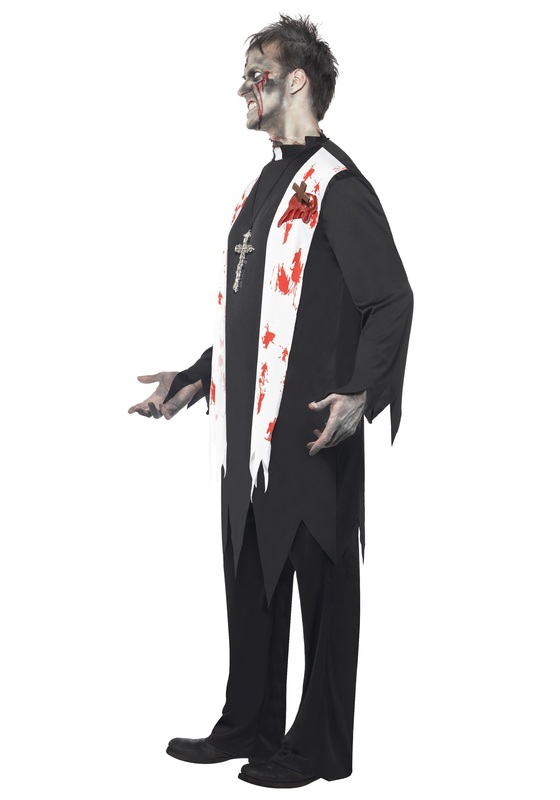 This outfit has got nice black pants and a black shirt with priest's collar. Then there's the scarf that's already been bloodied for you, not to mention a latex pierced heart. Have some fun with makeup and you'll be ready to join the virus party when it rolls around! Just make sure your friends know you haven't officially turned yet. Don't want any early shots to the head.